This is the third of three articles provided by John Schmul covering Disney's FANTASOUND semi-stereophonic optical sound system. As the title indicates, it deals with the particulars of the installation and setup of the enormous amount of equipment required to play Fantasia in select theatres across the country in 1940-41. The article, based on a paper presented at the 1942 spring meeting of the SMPE on May 1, 1942, was published in the Journal of the Society of Motion Picture Engineers in its July, 1942 issue. Summary.–A discussion of the various problems encountered in the road-showing of "Fantasia" with the multiple-track Fantasound equipment. The experiences and conditions encountered are presented as a guide for the further development of this very important field. It is expected that this system will add greatly to the dramatic presentation of pictures and will, in some form, replace our sound-reproduction systems. Fantasia was the result of an idea that grew over a period of three years from a "standard" one-reel "short" to a multi-million dollar road show that required the largest outlay of sound equipment that has been used commercially in the theater to date. Many new methods and procedures were found necessary to achieve the results that were desired for the final product. These new methods and procedures applied not only to the sound technic but the pictorial aspect as well. In order to appreciate fully the amount of artistic and engineering work that was expended on Fantasia it is interesting to review some of the highlights of our experience over a period of about three years prior to the premiere of the picture in New York on November 13, 1940. During the latter part of the year 1937 Walt Disney conceived the idea of making a cartoon "short" using as a basis some well known musical selection that lent itself to cartoon animation. A serious effort was made to interpret the composer's musical ideas pictorially as well as to record music that would blend into the picture and provide a combined, indivisible form of entertainment. The Sorcerer's Apprentice was chosen for the original, and was recorded in January, 1938, by 100 musicians conducted by Leopold Stokowski. The Sorcerer's Apprentice was recorded at the Pathé Studio, Culver City, Calif., on a production stage that was altered acoustically for the occasion. Our theory was to make a multiple-channel recording that would have satisfactory separation between channels so that suitable material would be available from which to obtain any desired dynamic balance in re-recording the original material. In the effort to obtain satisfactory separation between channels, a semicircular orchestra shell was constructed in the stage. The shell was then divided into five sections by means of double plywood partitions. Two difficulties were encountered with such a set-up; one was poor low-frequency separation; the other was the inability of the musicians at the rear of the sections to hear the music from the other sections, to such an extent the tempo was impaired. This condition was improved, at a sacrifice in separation, by having the musicians move nearer the front of the shell sections. As work progressed on the animation and re-recording of the material, Walt Disney decided to add other musical selections and to present a full-length presentation that would be outstanding in its scope. It was at this time that discussions first took place regarding special equipment for the showing of the picture. The goal that we hoped to reach was the reproduction in the theater of a full symphony orchestra with its normal volume range and acoustic output as well as the illusion that would ordinarily be obtained with a real orchestra. Many ideas were investigated, equipment was designed, and tests made of various combinations of equipment that would give the ultimate in a sound and picture entertainment. For a further description of these investigations the reader is referred to a paper on "Fantasound" by Garity and Hawkins in the August, 1941, JOURNAL. The best combination of music and recording conditions was desired for the additional selections, and it was decided therefore to abandon the Sorcerers set-up and to record the Philadelphia Orchestra in the Academy of Music in Philadelphia. This decision had two points in its favor; one being the fact that the acoustic properties of the Academy are excellent, and the second being that this orchestral group has been organized for many years and their musical talent is rated as one of the highest. At the time of the decision to do the recording at Philadelphia it was not known exactly what the music requirements would be in order to achieve the dynamic and musical balance necessary to the picture story being told. So that this requirement might be fulfilled in the re-recording of the original material, a multiple-channel recording was made and it was, of course, necessary to install nine studio-type recording channels in the Academy. The recording machines were located in the Academy basement, and since the inside of the building is constructed of wood, many safety measures had to be taken. No more than eighteen rolls of raw stock were allowed in the Academy at one time, and in order to insure a sufficient quantity of film for each recording session, a film-delivery truck was converted into a suitable loading room and was parked outside the building during recording sessions. All loading and unloading was done in this truck. The work of installation and recording was supervised by the authors, who spent the entire spring of 1939 in the Academy basement. To appreciate fully some of the problems encountered in the design of the road-show units it is necessary first to see what constitutes a complete unit. Each Fantasound road-show equipment consisted of sound reproducers, amplifiers, and loud speakers so arranged as to reproduce sounds from a multiple sound-track film run in synchronism with the picture film. The level and distribution of sound to the various stage and auditorium loud speakers was automatically varied in a predetermined manner by means of the control-tone and program sound-tracks on the multiple sound-track film. Fig. 1 is a block diagram of the Fantasound equipment as used for the reproduction of Fantasia. This system consisted of three separate program amplifier and loud speaker channels, and a control-tone channel; two selsyn-operated multiple sound-track reproducers; two selsyn operated sound-heads; two selsyn distributors; three two-way stage loud speaker systems; auxiliary theater auditorium loud speakers; and amplifiers and necessary operating facilities. Fig. 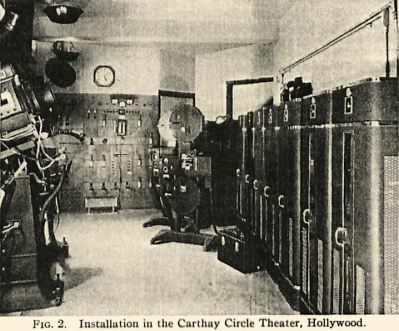 2 shows the equipment as installed in the Carthay Circle Theater, Hollywood. Power Supply.–All equipment was furnished for 60-cycle power. The amplifiers and power-supply units required 110-125-volt single phase current; the selsyn distributor 220 volts, three-phase. Where power fulfilling these requirements was not available, the necessary rotating equipment or transformers were supplied for the particular job. In order that the line-voltage variations would have the least effect upon the sound output level, the a-e input voltage to the exciter-lamp, supply was regulated, and regulated supplies were employed to furnish plate power for the variable-gain amplifiers and tone rectifiers, and polarizing voltage for the phototubes. Stage and Projection Room Space.–Due to the fact that each road show unit consisted of eleven 62-inch racks of amplifiers and power supply units, in addition to the other items indicated in Fig. 1, there existed quite a problem in finding space in the average theater for the various items. The wiring and operating facilities of the equipment were so arranged that it was necessary to install a minimum of six racks in the projection room in addition to the two multiple soundtrack reproducers. This was further complicated by the fact that many theaters available and suitable for road-show attractions generally did not have much of a projection room, if any. Power switching facilities were contained in one of the racks installed in the projection room so that the additional five racks could be mounted outside the projection room if space was not available therein. The two selsyn distributors on which were mounted the necessary starting and remote-control devices were located outside the projection room where conditions permitted. The speaker-field supply rack was so arranged that it could be mounted on the stage proper, near the loud speakers, in order to conserve wire runs; however, in some theaters this was not advisable due to the differences in local rulings as to whose duty it was to turn on and off the power to the rack. Space behind the picture screen was generally available for the loud speaker systems. The screen had to be moved up or down stage in many theaters in order to get the best distribution of sound. The three loud speaker systems required an average width of 44 ft, and it was always necessary to change the masking draperies on either side of the screen in order to obtain satisfactory sound transmission from the side loud speakers. Inter-Apparatus Connections.–The model road-show unit that was first manufactured made use of Cannon-type plugs and fittings for all inter-apparatus connections. Due to the large number of cable connections necessary, it was impossible to have a different type of plug for each circuit, and there was always the possibility and hazard of plugging a cable into the wrong position, with resulting damage to equipment. After a nation-wide survey of city inspectors concerning the use of rubber-covered cables and plugs on equipment located in projection rooms in a theater on a road-show basis, we found there existed many rulings, some definite and others rather vague. Some city inspectors would agree to the use of rubber-covered cables provided the show did not run longer than thirty days or so. Others would not agree to rubber-covered cables in the projection room on any condition. In one installation no exposed conduit was permitted, due, no doubt, to a safety measure as well as a "projection room beautification program." For the foregoing reasons all cables and plugs were eliminated and Greenfield or rigid conduit was used for all installation wiring. Emergency Features.–Since this was a major project so far as the amount of sound equipment to be used was concerned, and it was to be a "two-a-day" show with road-show prices, some emergency feature was desired in case of failure of the Fantasound system. In case of failure of the control-tone variable-gain part of the system, switching facilities were provided whereby the control-tone section could be by-passed and the three program channels could operate with the volume range that existed on the program tracks themselves. This still involved the use of a large percentage of the equipment, and further simplification of the emergency feature was thought desirable. The sound-track on the picture film was a standard variable-area, composite of the sound material that was located on the three program tracks of the multiple-track film. By means of one switch which actuated a relay system, the sound was transferred from the Fantasound set-up to the emergency channel, making use of the standard sound-track on the picture film, the emergency amplifier, and the center-stage loud speaker. Theater experience proved that the equipment was very reliable, and even though the number of component parts in the road-show unit was many times that of a standard theater set-up, the number of sound outages were no more than is experienced in a standard theater. The sound outages that did occur were caused in the majority of instances by operating failure rather than equipment failure. Such successful performance with the large quantity of equipment involved indicates the high degree of perfection that has been reached in present-day engineering and manufacture of theater sound equipment. Audio Power Requirements.–The success of any high volume range reproduction depends greatly upon having equipment with sufficient undistorted power-handling capacity. The Fantasound equipment has three 60-watt amplifiers for the stage speakers. This proved satisfactory for the majority of installations; the New York unit used additional power. The full capacity of the system was usually reached on peak levels during the performance. Equipment Testing and Program Level Adjustments.–The experimental work on the multiple-channel reproducing system indicated that slight differences in level between channels would give the effect of motion of the sound from one loud speaker to another. For this reason we found it necessary to provide facilities for readily checking the levels of the channels in order that the sound-perspective at the time of reproduction would be the same as intended during the re-recording of the picture. A portable-type bridging input amplified volume-indicator having a range of -50 to +40 db (6-mw reference level) was provided for making all measurements. Multiple-track test-films and film-loops were used for making such measurements as level balance, gain-change characteristics, push-pull balance of the sound-track, and frequency response. Bridging jacks only were used at points in the circuits where routine measurements were to be made. Switches were so connected that resistance loads could be substituted for purpose of measurement. Vacuum-tubes having any bearing on the characteristics of the control-tone variable-gain section of the system were aged, balanced, and matched. This simplified the work for the field personnel in the routine maintenance of the equipment. Operating Features.–The routine show-operating details were kept as near to standard theater practice as possible; however, due to the use of a selsyn motor system and separate film reproducers, there did exist some difference in operating technic. There were three stations for the operating of the sound-control and motor systems, The motor controls for the selsyn system were operated by a sequence switching arrangement that was quite foolproof. Suitable pilot-light indicating devices were employed for all control stations, and changeovers could be made from any station at any time. It was general operating practice to allow the selsyn motor on the picture machine and the multiple-track reproducer to remain "in lock" during the entire show, and because of this very little trouble was experienced from "out-of-sync" conditions. The power circuits were so designed that the entire system could be turned on by one switch, and during normal operating times such was the practice. Manual switching was provided for monitoring the tone or program channels individually. This was fairly satisfactory with the exception that the volume range of the recording was too great for projection-room monitoring. With any reasonable adjustment for satisfactory high-level sounds it was impossible to hear the low-level sounds over the machine noise. Future equipment should be designed with a volume-compressor stage in the monitor amplifier and possible means for monitoring the combined channels. Shipping Facilities.–All equipment was shipped from the factory in caravan packing units. Such packing facilities would no doubt have been satisfactory for the transfer of the equipment between installations. The weight of a complete Fantasound equipment was approximately 15,000 lbs. ; it was packed in forty-five cases and required one-half of a standard freight car space. theaters it was necessary to enlarge the projection room, as sufficient space was not available for all the equipment nor was there space nearby that could be used. This item made a large increase also in the installation cost. As a general rule the projection rooms encountered were poorly arranged and too small for a first-class installation of the entire equipment. It must be remembered, however, that these theaters were not usually first-run motion picture houses, but were theaters that could be engaged for such a road-show project. In some of the earlier installations the right and left stage speakers were placed as far out to either side as conditions would permit. Preliminary tests indicated that this was undesirable, as there was an objectionable sudden movement of the sound when shifted from one loud speaker to another. The condition was corrected by moving the side speakers nearer the center by such an amount that a smooth transition occurred when the sound was shifted from one speaker to another. The correct separation of the theater stage speakers for obtaining a sound illusion similar to that obtained at the time of re-recording depends to a certain extent upon the general acoustic properties of the re-recording monitoring room and the location and spacing between, the monitor speakers. Due to the fact that the Disney re-recording monitoring room is a 600-seat theater of average theater acoustic properties, it was more or less an easy matter to anticipate the final results. The normal undistorted audio-power output of the equipment was 220 watts, which proved satisfactory for most theaters. In the Broadway Theater (New York) the power was increased to 400 watts and three additional loud speaker systems were added to the stage complement to handle the additional power. The music and the control-tone tracks for Fantasia were re-recorded with the idea that a certain volume-range could be used in the theater showing the picture. This volume-range as chosen, which consisted of a 40-db control-tone range and a 30-db range on the music tracks, was found to be greater than could be tolerated in the theater. It was general practice to use the high-level section of the music as the point at which the gain-controls were set for the correct level. If the low-level portions of the music were below the theater noise-level, the volume-range was reduced by changing the ratio of the control-tone-level to the variable-gain amplifier output, The music was re-recorded with a one-to-one ratio; however, in some theaters it was necessary to use a ratio of eight to five. This means of controlling the volume-range of sounds that have already been recorded was found to be very useful and necessary for the successful presentation of the picture. The best audience reaction to the high level musical passages occurred when the level was at a certain value, which varied from theater to theater and was determined by trial and error. A decrease of 2 db in this level resulted in a decided "letdown" of audience reaction as the "thrill," or "punch" was lacking. Conclusions.–The outstanding success of Fantasia in its limited number of runs with Fantasound has demonstrated the value of this means of increasing the dramatic value of a picture. (1) The amount of equipment required and the time necessary to make the installation. (2) Because of the time element attractive theaters were not available to us, as the first-class houses in the various communities had established policies and the installation of the equipment would generally require darkening the house for a few days. (3) The advent of wartime conditions precluded the possibility of developing mobile units that would have lessened installation time and costs. (4) The variation in the regulations throughout the country, both as to operating personnel and local ordinances, materially affected the operating and installation costs. (5) Space factors of the projection room in particular were problems of major importance. We are convinced that, with greater simplification of equipment in keeping with the available space in the theater, the elimination of the separate selsyn sound-track reproducer, and the combining of the multiple-track on the composite print, future sound reproduction will employ multiple-track reproduction with automatic volume control, and, something that was not used in Fantasound, the automatic change of frequency-response with volume. We can only express our own opinions and the opinions of those who worked with this equipment; viz., having used the multiple-track system, no matter in what form, the ordinary sound-track reproduction is flat and dull by comparison. We can not say what the problems of original recording would be for the live-action producer. We can assume they will be many and various, but we are sure that with study and ingenuity they can be overcome, and the final results will be worth while. ©1942 Journal of the Society of Motion Picture Engineers.